Investigators never agreed on the cause of the fire that killed 10 residents of a shabby nursing home on May 6, 1972. The number of deaths make the fire at Carver Convalescent Center, 1527 E. Washington St., the worst single catastrophe in Sangamon County history. Among those expressing condolences was President Richard Nixon, who later intervened to speed up enactment of new federal nursing home rules that had been partly inspired by the Carver tragedy. Hurtis Hall, age 66; Thomasella Newbern, 70; Cleopatra “Cleo” Evans, 71; Ora Watson, 88; Estella Sanford, 66; Lizzie Greenup, 98; Burnett Leland, 76; Belle Culp, 76; Henry Johnson, 74; and Dora Williams, 52. Another resident, Ponto Burgett, about 71, was critically injured in the blaze, but survived. Burgett died in 1988. 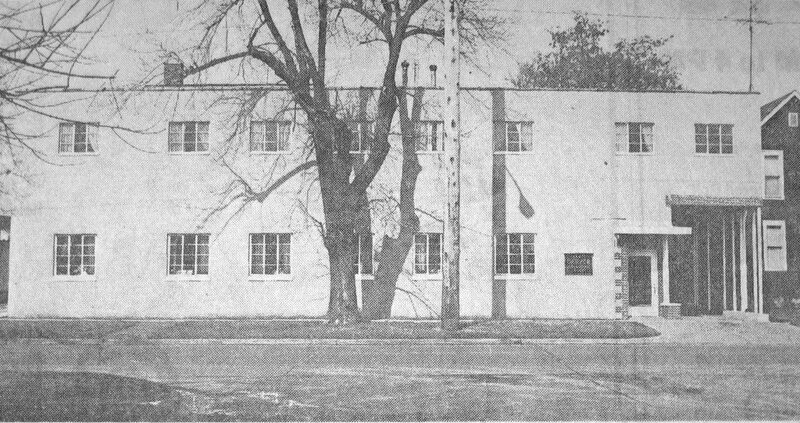 The Carver Convalescent Center received its corporate charter in April 1952; the original developers were Duane Traynor, John B. Hendricks and Conrad Noll Jr. The source of the name is unclear, but it’s likely the Carver center was named in recognition of famed African-American scientist George Washington Carver. It served exclusively black residents. The original building was a private home, apparently constructed for the family of Thomas McGrath, a coal miner, in the early 1890s. It went through a series of hands before the Carver home opened in July 1952. At the time, it had capacity for about 22 people. At some point in its early existence, Byron Weisbaum (1911-98), a physician, and his wife Marilyn (1922-94), a registered nurse, became owners of the facility. In January 1954 they sought and apparently received city council approval to build an expansion that would accommodate 25 more residents. The original part of the building was wood frame construction; the newer section had masonry on the front and west side, but the home was “basically an old two-and-a-half story L-shaped frame house,” assistant state fire marshal Joseph Patton told reporters the day of the fire. In its early years, the Carver Convalescent Center was the only local nursing home that accepted African-American residents, according to statements made after the fire, and it was supported by Springfield’s black community. For Christmas 1952, for instance, the Shriners’ Kamar Temple 56, an African-American temple, donated two clock radios to Carver. The home “currently provides for 22 patients, none of whom had a radio,” according to an Illinois State Register item about the gift. Obituaries for Carver residents who had passed away often emphasized their local and family ties. By the early 1970s, however, many Carver residents had been transferred there from state institutions, like Jacksonville’s former hospital for the insane. Thirty-eight of the 40 residents at the time of the fire were public aid recipients. Marilyn Weisbaum succeeded Berg as Carver administrator in December 1971. After the fire, a number of officials said she had begun to improve the facility. They also said an evacuation plan worked out between Carver and the Springfield Fire Department in March 1972 had kept the death toll from being even higher. The building had been inspected by the state fire marshal’s office the day before the blaze and by the state Department of Public Health the day before that, and no major violations were found. However, Carver was already operating under a provisional license, because it was not certified to provide the level of care many of its residents needed. Under a state Public Health timetable, those residents were to be transferred elsewhere by 1975. Firefighters arrived at the house minutes after an automatic alarm went off at Firehouse No. 1 at 5:35 a.m. May 6. Marilyn Weisbaum had recently had moved Carver’s incapacitated residents to the first floor. However, all those killed slept on the second floor. It took several days to confirm the names of two of the victims, and Sangamon County Coroner Norman Richter said it was even harder to locate relatives. “One man hadn’t seen his aunt for 47 years and a woman hadn’t seen her aunt for 50 years,” he said. The fire reduced the second floor of the Carver home to rubble. As a result, officials never determined the cause of the blaze, and there was a difference of opinion between city and state authorities over where it began. City fire investigators said they had determined the fire started in a second-floor eating area above the kitchen. It was used by patients who were unable to get to the first-floor kitchen. Investigators from the fire marshal’s office, however, suspected arson. They said they believed the fire had begun at the base of a stairway at the rear of the home and that it might have been set deliberately, possibly by a man who had been turned down for a job there. The man underwent a lie detector test and psychiatric exam, but results were inconclusive, according to William Ascher, the Springfield Police Department’s chief of detectives. The two aides who were in the home May 6 supported the city’s version of events. Rachael Brooks said she went up the back stairs after the home’s fire alarm sounded and found smoke on the second floor. She then helped three residents down the front steps and left the building herself. Beulah Washington said when she went up the front steps, she saw the fire in the ceiling. Washington got two men onto a second-floor deck near the rear fire escape, but couldn’t carry them any further. Heat from the fire forced her to crawl down the escape herself. Firefighters rescued one of the men from the deck. The other, Henry Johnson, apparently re-entered the building and was killed. The coroner’s jury returned an open verdict, meaning they could not determine the fire’s cause. When a man who played music for the residents plugged in an amplified instrument, sparks would fly from the outlet. Byron and Marilyn Weisbaum said none of that was true while Mrs. Weisbaum was in charge of the home. They promised to look into whether such conditions had existed earlier, but newspaper files indicate no followup was ever published. She said the money would be used, for example, to buy one man a new artificial leg and another a pair of glasses. One man simply wanted the $4 he had lost, “which meant a lot to him,” Karlson said. Longer term, the Carver Memorial Peoples Foundation and Springfield and Sangamon County Community Action, with federal and city help, established the Carver Health Clinic in the former Immanuel Lutheran School, 1522 E. Matheny Ave. The clinic eventually became part of services provided by the Springfield Health Department (which since has been merged into the Sangamon County Department of Public Health). On the federal front, the Nursing Home Fire Safety Act of 1973 authorized loans to help nursing homes buy and pay for sprinklers and other fire safety equipment. Nixon pushed the Department of Health, Education and Welfare to publish the necessary regulations in quickly following a December 1973 meeting with Don Barry of Springfield, then president of the American Nursing Home Association, and two other ANHA officials. The hulk of the Carver Convalescent Home was demolished on city orders in December 1972. Little is known about the backgrounds of the 10 Carver fire victims. Hurtis Hall, a promising clarinetist during his years in the Springfield public schools, as a young man listed his occupation as “traveling musician” in city directories. In the 1930s, however, he was in and out of the Jacksonville State Hospital for the insane. He is buried at Oak Ridge Cemetery. Thomasella Newbern is buried in Greenwood Cemetery, Decatur, where her son and daughter-in-law lived. Cleopatra “Cleo” Evans lived for 55 years in Taylorville and had family there. She is buried in Taylorville’s Oak Hill Cemetery. The only information available about Ora Watson is that she obtained a Social Security number in Arkansas in 1965. Her burial place is unknown. Estella Sanford was a Missouri resident when her Social Security card was issued in 1953-54. She lived on East Monroe Street in 1966, when she was struck and injured by a motorcycle, according to Illinois State Journal stories. She was hospitalized for a month. Her sister, Hattie Washington of Springfield, died in 1965. Lizzie Greenup (maiden name possibly Cummings), the oldest of the victims, married and had two children in Jacksonville before she was committed, sometime before 1910, to the Jacksonville State Hospital. U.S. Census records indicate she was a patient there at least through 1930. Her husband and children moved to the Oakland, Cal., area following her commitment. Belle Culp was arrested in 1922 on a charge of assault with a deadly weapon. She had been boarding with a couple on North Lincoln Avenue while she cared for an invalid woman. Culp was accused of shooting the woman’s husband after he objected to her leaving dirty dishes in the sink. Newspaper files don’t say how the case was resolved, but, during an inquiry into her sanity, Culp was found to have smallpox, the Illinois State Journal reported. Henry Johnson, who was nicknamed “Little Henry,” was considered mentally “slow,” according to testimony at the coroner’s inquest into the fire. Dora Williams was an Oklahoma resident when her Social Security card was issued sometime before 1951. No information is available about Burnett Leland. Note: Many internet sources say, incorrectly, that the Carver Convalescent Home burned on May 5, 1972. The actual date was May 6. This entry was posted in African Americans, Disasters, Fires, Public health. Bookmark the permalink.